On Earth periglacial landscapes develop in permafrost regions, as a result of the repeated freezing and thawing of the upper layer of the ground over seasonal cycles. Consequently their presence on Mars would provide a geomorphic indicator for regions where water may have been thawing in the geologically recent past. Utopia Planitia is a leading candidate for possible periglacial environments on Mars and a variety of studies have focused on the this region (e.g. Soare et al. 2007; Lefort et al. 2009; Séjourné et al. 2011; Haltigin et al. 2014). Image 2: Context map showing the locations of figure one on the southern wall of the impact crater and figure three on the northern wall. 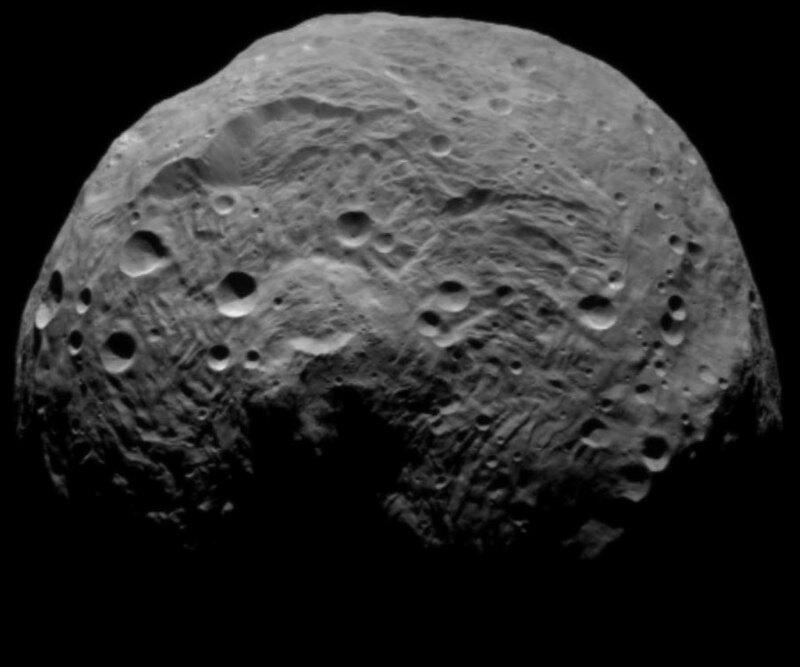 This site is interesting as it contains several landforms which appear morphologically similar to those found on hillsides in periglacial environments on Earth. 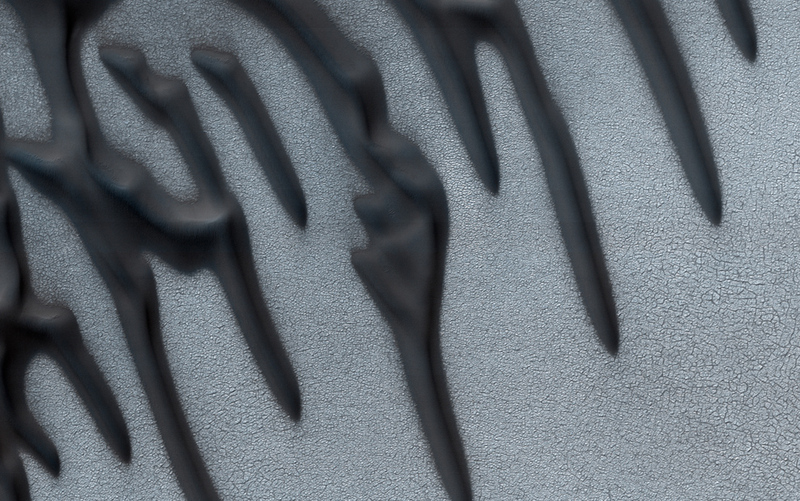 Image one shows a series of lobate structures which have a similar morphology to terrestrial solifluction lobes (Matsuoka 2001). Several banks of lobes can be seen progressing down the hillside. 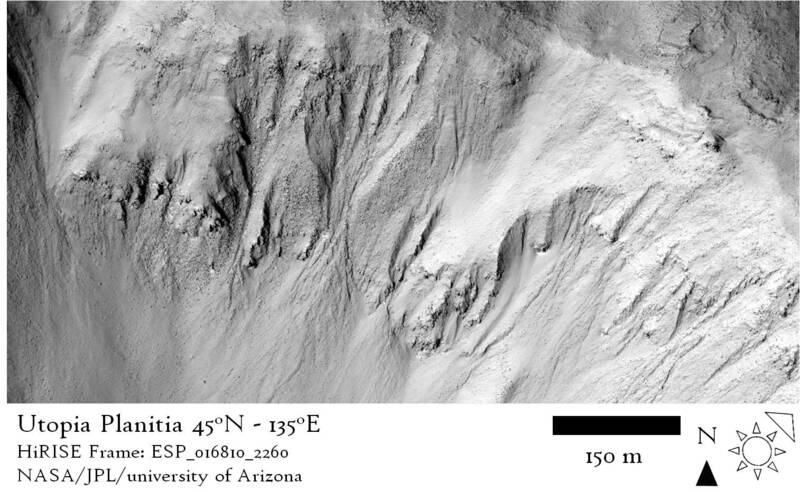 Other instances of similar lobate features on Mars are documented by Johnsson et al. (2012). On the left hand side of the image are several small lines of metre scale clasts. These run parallel to the direction of slope and may be analogous to the sorted stripes found on hill sides in the terrestrial arctic. Sorted patterned ground occurs over a variety of slopes but stripes are predominantly found in the steepest areas, while polygons and labyrinths of organised clasts occur on flatter ground (Kessler and Werner 2003). Thus the location of these features on a crater wall supports this hypothesis for their formation. Similar assemblages of clastic stripes and lobes have been observed across the northern plains, particularly at high northern latitudes (e.g. Gallagher et al. 2011). The southern wall of the crater is not the only part of this landscape to exhibit features which may be related to the thaw of water. The northern wall lacks lobate features, but is instead dominated by several large gullies as shown in image three. These structures could also result from the thawing of liquid water, although on a much more dramatic scale (Soare et al. 2007; Aston et al. 2011). Image 3: On the northern wall of the crater are several gullies. This suggests that this wall of the impact crater has also been shaped by the action of liquid water in the geologically recent past. 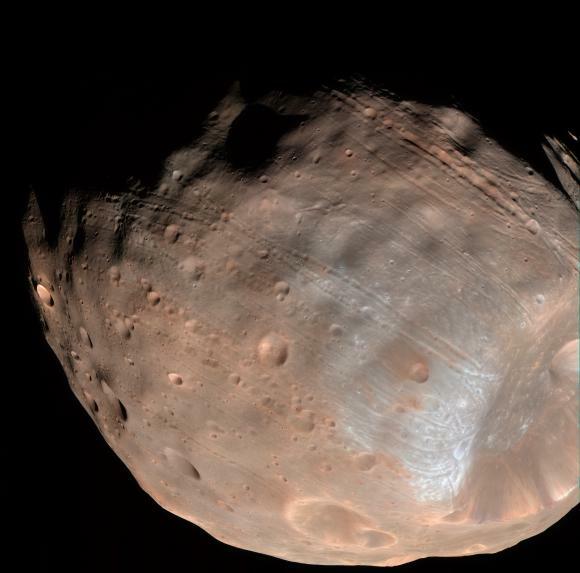 Aston A. H., Conway S. J., Balme M. R. (2011) Identifying Martian gully evolution. Geol. Soc. London, Spec. Publ. 356:151–169. Gallagher C., Balme M. R., Conway S. J., Grindrod P. M. (2011) Sorted clastic stripes, lobes and associated gullies in high-latitude craters on Mars: Landforms indicative of very recent, polycyclic ground-ice thaw and liquid flows. Icarus 211:458–471. Haltigin T. W., Pollard W. H., Dutilleul P., et al. 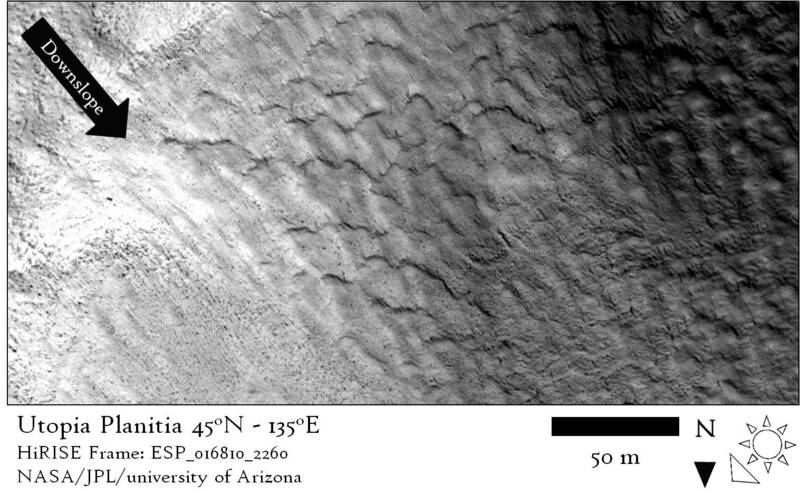 (2014) Co-evolution of polygonal and scalloped terrains, southwestern Utopia Planitia, Mars. Earth Planet. Sci. Lett. 387:44–54. Johnsson A., Reiss D., Hauber E., et al. (2012) Periglacial mass-wasting landforms on Mars suggestive of transient liquid water in the recent past: Insights from solifluction lobes on Svalbard. Icarus 218:489–505. Kessler M. A., Werner B. T. (2003) Self-organization of sorted patterned ground. Science 299:380–3. Lefort A., Russell P. S., Thomas N., et al. (2009) Observations of periglacial landforms in Utopia Planitia with the High Resolution Imaging Science Experiment (HiRISE). J. Geophys. Res. 114:1–18. Matsuoka N. (2001) Solifluction rates, processes and landforms: a global review. Earth-Science Rev. 55:107–134. Séjourné A., Costard F., Gargani J., et al. (2011) Scalloped depressions and small-sized polygons in western Utopia Planitia, Mars: A new formation hypothesis. Planet. Space Sci. 59:412–422. 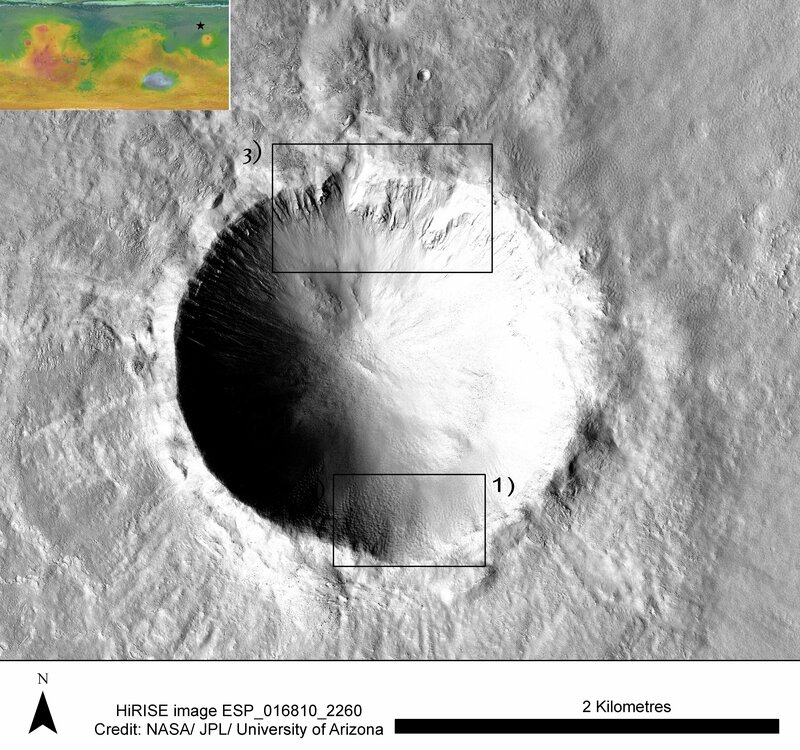 Soare R. J., Kargel J., Osinski G., Costard F. (2007) Thermokarst processes and the origin of crater-rim gullies in Utopia and western Elysium Planitia. Icarus 191:95–112.